Amelia Earhart Mystery Solved. Is Finding Bigfoot Next? It’s taken 80 years to figure out what happened to Amelia Earhart, the legendary aviatrix whose plane went missing over the Pacific Ocean in 1937. Or so the media insist. In fact, the truth was revealed by Leonard Nimoy 40 years ago. It was during an episode of one of the greatest shows on television, In Search Of. Between 1977 and 1982, Leonard Nimoy hosted the often spooky and mysterious television series In Search Of. Incorporating interviews, photographic evidence, and dramatizations, the show dealt with such subjects as aliens, ghosts, and the Bermuda Triangle. The program was always prefaced by a voiceover saying: "This series presents information based in part on theory and conjecture. The producer's purpose is to suggest some possible explanations, but not necessarily the only ones, to the mysteries we will examine." In other words, take what you are about to see with a grain of salt. Or perhaps a box of Morton's. But what if hokey speculation turns out to be … correct? 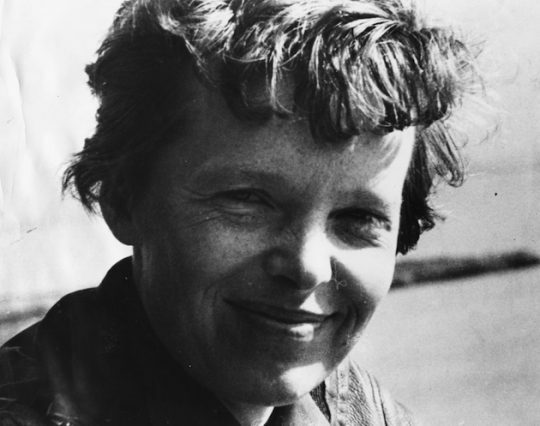 In June 1977, In Search Of aired its Amelia Earhart episode, which posited a number of theories, including one suggesting Amelia Earhart came back to the United States with a new identity—as Irene Bolam. Mrs. Bolam, who died in 1982, called this "utter nonsense," and the theory has since been discredited. But the last segment of the show focused on former CBS newsman Fred Goerner, who spent years investigating the disappearance of Earhart and her navigator Fred Noonan. CBS in fact sent Goerner to Saipan, where it was believed the Americans ended up. Islanders claimed to have seen an American female held prisoner by the Japanese in 1937—fully four years before the United States and Japan were at war. It was understood by these Saipanese that the woman was a female pilot—and an accused spy. According to Goerner, Earhart and Noonan survived the plane’s crash into the ocean, were picked up by a Japanese fishing vessel, and ultimately transferred to Saipan, where the two died. Proof can be found, said Goerner, in Counterintelligence Corps documents that remain classified by the U.S. government. It’s been claimed that the last leg of Earhart’s flight around the world involved taking aerial photos of Japanese activity in the Pacific—i.e., a reconnaissance operation on behalf of the United States. What’s more, President Franklin Roosevelt is tied to this theory as part of a coverup: FDR would have been disgraced if the public knew he was partly responsible for Earhart's capture and death, so he kept everything secret. Fast forward to the modern day and the latest revelation of a photograph found in the National Archives purporting to show Earhart and Noonan and wreckage of their Lockheed Model 10 Elektra in the Marshall Islands. The History channel, which is behind this recent development, will air its findings on July 9. History says the newly unearthed photo has been expertly authenticated. But others, including Earhart author Mike Campbell and the Daily Mail, insist the new photo is not new at all, that it dates to 1940, and that neither Earhart nor Noonan are in the picture—it's merely a publicity stunt by History to spike ratings. Fred Goerner (who died in 1992) could one day be vindicated, though questions linger: What of the role of FDR and, for that matter, the Japanese government? The truth is out there. But if In Search Of got this right, maybe it’s also right about Phoenicians landing in North America and the Amityville Horror. Maybe Butch Cassidy did die in 1937. And maybe we're just days away from capturing Bigfoot. Update July 10, 2017: Having seen the two-hour special on History last night, I was surprised how compelling it was despite the melodramatic acting of the investigators. It did not mention the theory that Earhart and Noonan were doing recon or a coverup involving FDR. Even if we discount the photo, the communiqués suggesting government acknowledgment that Earhart might have survived the crash and the eyewitness accounts—it seems to be generally understood in the Marshall Islands that Earhart's plane landed there—all made for great television. The program culminated in a grave excavation that turned up … nothing. This entry was posted in Culture and tagged Amelia Earhart. Bookmark the permalink.